The holidays are here are again, and this year, it’s time to go all out! If your home is the place to be this Thanksgiving or Christmas, we’ve got some tips to make sure that this holiday season will be one to remember for years to come! It doesn’t take much to transform your home into a Texas winter (we use this word loosely) wonderland! - For Thanksgiving, make an easy yet beautiful centerpiece on the dining table out of fruit. Fill a decorative bowl full of your fruit of choice (we recommend apples or pears) and attach paper leaves to the stems with messages of “thanks-giving” written on them. You can even ask your guests to write a Thanksgiving message. The same concept can be used as place cards on the table for seating arrangements. - If it’s a winter wonderland you truly desire, then go for it! White décor is in! Decorate your house with a stunning white fur tree, white walls and, don’t forget, fake snow. Use a bold accent color such as red or blue to complete the look. White lights are also a lovely addition to the tree, if you’re wanting to keep it elegant. - Decorating on a budget this year? No worries! Simple additions such as evergreen clippings, pine cones and homemade items from the kids, such as candy cane cut-outs and a show-stopping gingerbread house can make your home feel full of cheer. These are also great activities that the whole family can enjoy. 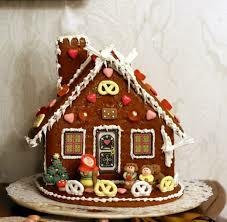 Although they now sell kits that are a breeze, here’s an easy “how-to” of a made-from-scratch gingerbread house. - We know you’ve always wanted to fry a turkey, and not just because it looks dangerous. It’s delicious. Sure, thousands of people burn their house down each year trying to fry a turkey, but it’s not going to be you! Check out this Art of Manliness’ video and be safe! - Not only is ambiance important during the holidays, but dinner can actually make or break your special day, so we found some yummy recipes to guarantee everyone will go home with a full and happy tummy. We turned to Texas Monthly for something a little different but still with a Texas twist. Instead of the usual sides, why not try making these delicious Sweet Potatoes with Ginger, Pecans and Jalapeños? We bet you won’t be sorry! - We also love these Cranberry and Pecan Tamales. Even in the tamale capital of Texas (which we assume we are), this is something you don’t often find. - Oh, and don’t forget to leave some cookies for Santa. Here’s a fun recipe for the kids that’s hassle free for you! Just make sure to ask Santa for your dream home, but if he doesn’t come through, you can always give us a call at 210-494-5400 or fill out our online form. We may not have any reindeer, but we know how to make dreams come true! Happy Holidays from our family at Stone Creek Custom Homes!